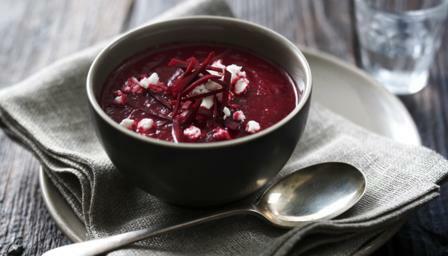 Beetroot soup is not only a fabulous colour but delicious too. Try adding a glug of vodka for the classic Borscht experience. Place the halved tomatoes in an ovenproof dish. Throw over the garlic and drizzle over half the olive oil. Roast for 25-30 minutes in a fairly hot oven (190C/375F/Gas 5) until soft and pulpy. Rub through a sieve to remove the skin and pips. Heat the remaining oil in a pan and sweat the onion for a few minutes until soft. Add the beetroot and the stock and bring to the boil. Season lightly with salt and freshly ground black pepper. Simmer gently for 7-10 minutes until the beetroot is tender. To serve hot, reheat the soup until thoroughly hot but not boiling. Divide between warm bowls and crumble over a little feta into each bowl. Serve with crusty bread.